The best thing that can be said about the United States' 2-0 friendly defeat to Ukraine on Wednesday is that at least it won't raise expectations to unrealistic levels ahead of the World Cup. The worst thing about it? Take your pick. 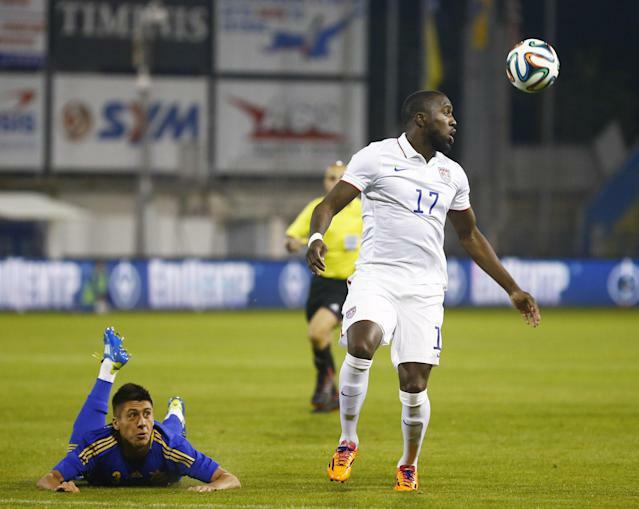 There was Jozy Altidore and Clint Dempsey looking sadly devoid of any spark or confidence. There was a small group of World Cup wannabes who probably played their way out of any chance of a trip to Brazil. Then there was just the simple fact that the U.S. was outfought, out-thought and totally outplayed over 90 minutes by a team that couldn't qualify for this summer's tournament. Now, international friendly matches remain one of soccer's great oddities. They are strange affairs that see multiple substitutions and sometimes little cohesion and often give no real indication of future success or performances. Even so, with those "100 days to go" countdown clocks already switched on and ticking away, coach Jurgen Klinsmann would have hoped for better than this fairly dispiriting display at the end of a difficult week. The U.S. looked labored and rushed and were painfully non-dynamic. Dempsey, the captain and leader and for much of the past four years the best player the American side had at its disposal, continued his mystifying malaise. He has not looked like his old self since returning to Major League Soccer last year and couldn't rediscover his swagger during a Premier League loan stint at former team Fulham. Those signature hard-charging runs haven't had the same bite for a while and were quickly snuffed by the Ukraine defense in Larnaca, the small resort in Cyprus where the game was relocated due to political turmoil. Klinsmann refers to Dempsey and Altidore as part of his team's "spine," one that also includes goalkeeper Tim Howard and midfielders Jermaine Jones and Michael Bradley. But while this squad came through qualifying impressively and is not spineless, it is in danger of becoming toothless unless Dempsey and Altidore can get something going over the next couple of months. Altidore may not get much chance to do so after falling out of favor at his Premier League club Sunderland. Just one season after dominating in the Dutch league with AZ Alkmaar, the 24-year-old has found life in England much tougher and was dropped for Sunderland's biggest game of the season, last weekend's Capital One Cup final, in a loss to Manchester City. Altidore didn't find much to his liking in Larnaca, either. His opportunities up front were limited by Ukraine's dominance of possession and he wasn't able to impose his physical will upon the backline. He didn't play terribly and showed a few brief flashes, but like some others in the U.S. shirt he seemed lacking in energy. That accusation could not be pointed at Ukraine, which played with the spirit and motivation of a team representing a country in crisis. Captain Anatoliy Tymoshchuk and his colleagues made no secret that this was not a "friendly" for them, wishing to present a united front and provide some solace for those affected by the upheaval in their homeland. Even with the game removed from its originally scheduled location of Kharkiv and played in front of less than a thousand fans (a collection of Ukrainian expats, curious locals and bewildered tourists), Ukraine played like it mattered. Andriy Yarmolenko got the first goal for Ukraine after 12 minutes and Marko Devic finished off the Americans with just over 20 minutes remaining. Both times, the U.S. defense was at fault and Tim Howard's efforts in goal were for naught. By then, Klinsmann could have been forgiven for wishing that this game, which looked likely to be cancelled in the days before it, hadn't gone ahead at all. The coach was determined to get a game in as this was the last chance he will get to see his European-based players before the final pre-World Cup training camp, but what positives he was able to glean only he knows. Dempsey and Altidore are among a group that are guaranteed of not only their spots in the squad for Brazil but probably in the starting line up, too. Klinsmann would rather take his chances that their form will improve than gamble on unproven players such as Aron Johannsson, who looked lively as a second-half sub. Many other places are up for grabs and no one did much to stake a claim for one here. John Brooks does not look World Cup ready, neither does Edgar Castillo and both are now surely on the outside looking in. Oguchi Onyewu was an AC Milan player going into the last World Cup. Now he is at Sheffield Wednesday in England's second-tier Championship division and while his effort to make the roster for Brazil has been admirable, he did nothing here to make regular central defenders Omar Gonzalez and Matt Besler shake in their boots. There was nothing to make Germany, Ghana or Portugal quiver either and though Ukraine is in reality better equipped than several of the 32-team field heading to South America, the U.S. is some way short of being in the shape and form that Klinsmann would like. World Cup campaigns don't die in March but as Brazil edges closer, the U.S. – and many of its players – need some urgent momentum. They are running out of time to find it.